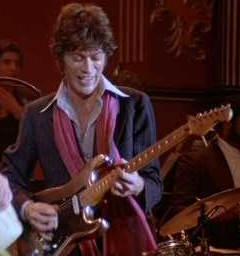 While there is some dispute whether Robertson had his 1958 Strat bronzed before or after it was featured in "The Last Waltz", it is clearly a bronze color in the film. He had also moved the middle pickup next to the bridge pickup so as not to hit it while using finger picks. In 1995, the guitar was loaned to the Rock and Roll Hall of Fame with what appeared to be a Floyd Rose type bridge and tremolo arm installed. Robbie Robertson sure has a fine piece of luxury with that 1958 vintage Strat. How I wish they made guitars like they used to.